Home Tampa Bay Buccaneers My 2 Bullion: Should the Bucs court Adrian Peterson? 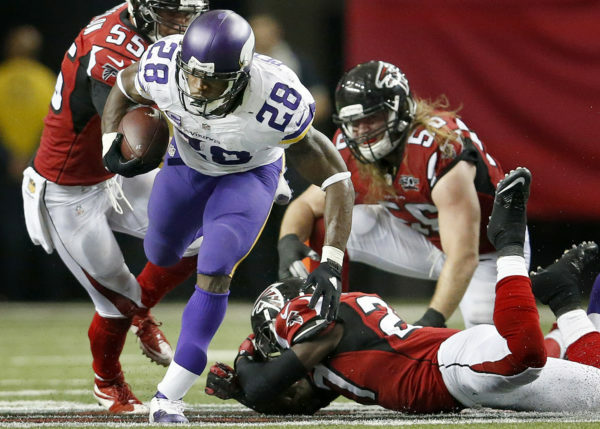 My 2 Bullion: Should the Bucs court Adrian Peterson? AP is coming off another knee injury and he feels that he is able to play another five years at a high level. Over his ten years in the NFL, he is long in the tooth, however, the Bucs are in a pickle; and that pickle is our backfield. It is definitely a huge question mark. Jacquizz is a free agent and Martin, whose future with the Bucs is another question mark, starts out the season missing the first two games due to suspension. The Bucs could fill the void through the draft or sign a salty veteran like AP, as a short term fix, but His contract, in my opinion, would have to be heavily laden with performance incentives. If the parties agree with those terms, I say roll the dice and pick up a running back in the later rounds of the 2017 draft. Just don’t get me started about the holes on the offensive line. This is going to make for an interesting off-season. That’s just my 2 bullion. The Buccaneers and Adrian Peterson not likely to happen. If you have the 2nd ranked running back shouldn’t he get the ball more? Previous articleCaviar wishes and defensive line dreams. Next articleNo “Cooking” in Tampa Bay!